Hell is other people, it’s been said, but Samuel Bercholz says that’s wrong. Rather, it’s our illusion that we are separate from other people and indeed from all sentient beings that condemns us to hell. He knows. He’s been there. 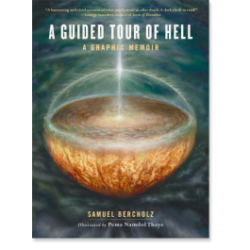 He tells the story of his near-death experience and sojourn in Hell in his graphic memoir, A Guided Tour of Hell. Bercholz almost died during a severe heart attack and during the 5 or so minutes that he spent straddling the border between life and death, he spent aeons in Hell with the Buddha of that region as his guide. Perhaps he was chosen because, as a long time publisher of Buddhist books — he’s the founder of Shambhala Press — his life’s work has helped countless readers on their spiritual path. What he found there is recounted and portrayed in his graphic memoir, A Guided Tour of Hell. 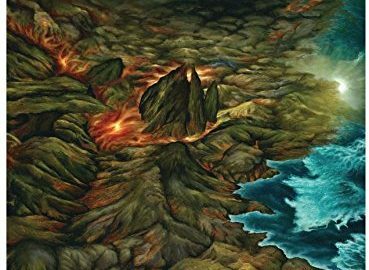 Accompanied by the stunning illustrations of Pema Namdol Thaye, A Guided Tour of Hell is a Dantesque exploration into realms of ice and fire. Those who find themselves there are racked by eternal torment caused not so much by their deeds when they were alive but by their thrall to the illusion of separation. Separation leads to rage, envy, judgement and hatred — emotions, according to Buddhist philosophy that form the bedrock of suffering, or samsara. Whether you view Bercholz’s book as fact or metaphor, it is a cautionary tale that we all should heed for the sake of our souls.